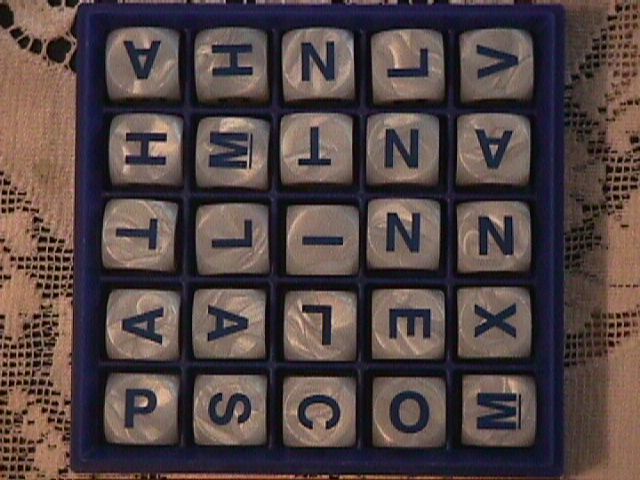 Note: Boggle is a registered trademark of Parker Brothers. 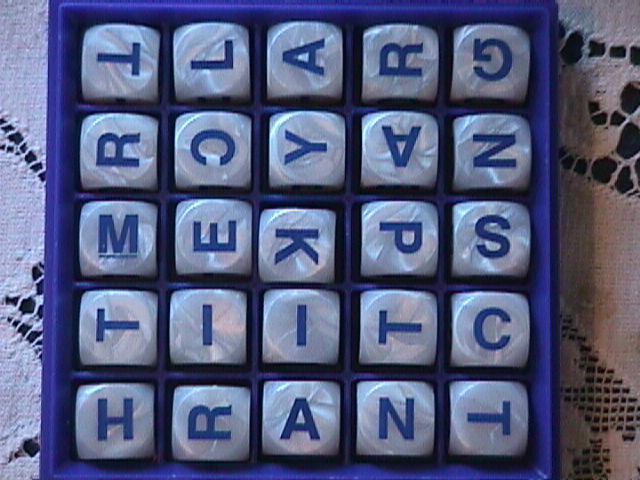 I made a stupid little random Boggle board generator. Look for it to have graphical output sometime in the future. Ten people showed up, so we did ten preliminary rounds with one person sitting out each round. Each round had three tables of three players, seating determined randomly. The top four players of the preliminary round were Kevin (that's me), Bitty, Anne, and Debby. These people played a four-round championship. It was close, but the day was had by Debby. Debby wins a T-shirt with an iron-on Boggle design, yet to be made. I'll try to get it done in time for the next tournament, which may be some time in October. Keep watching this page for more information. The word lists that I had everyone do aren't going to be used in the tournament. Think of it as an investment made in the tournament. I'll be giving a special prize for the coolest unique word on the word lists. I spent some time searching the web for informaiton on how to schedule a tournament like this. I had no success. I spent some time sratching out on paper a scheduling assuming exactly 12 people. It got complicated enough that I've decided to just go with random scheduling. Each round, people will be assigned seats randomly. We'll see how it goes. So it looks like I'm going to host a Boggle tournament. The date is June 30th, 2002. Here is the email that I sent out about it. Here are some directions to the Loring Greenough House in Jamaica Plain, the location of the tournament. I want to set up initial pairings for the tournament based on skill level. Any self-rating system I ask people to do would be fairly arbitrary. I want to be a little less arbitrary. 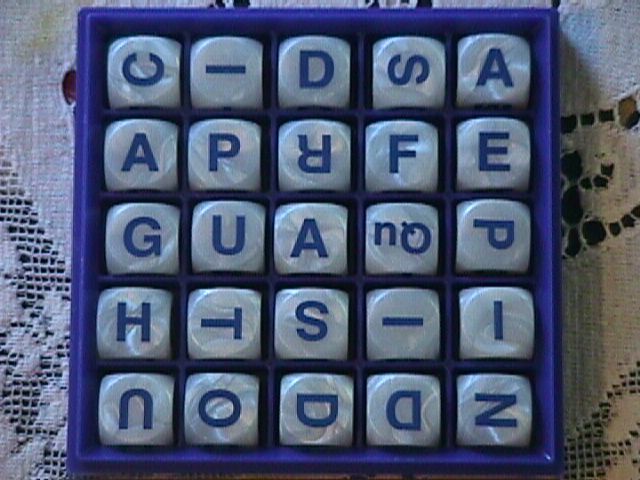 Below are links to pictures of four different Boggle boards. I shook it up, played it myself, and then took a picture. If you are interested in playing in the tournament (or if you just want to have some fun), play each board. Give yourself 3 minutes, and then send me your word list. I will score it according to the Scrabble dictionary. 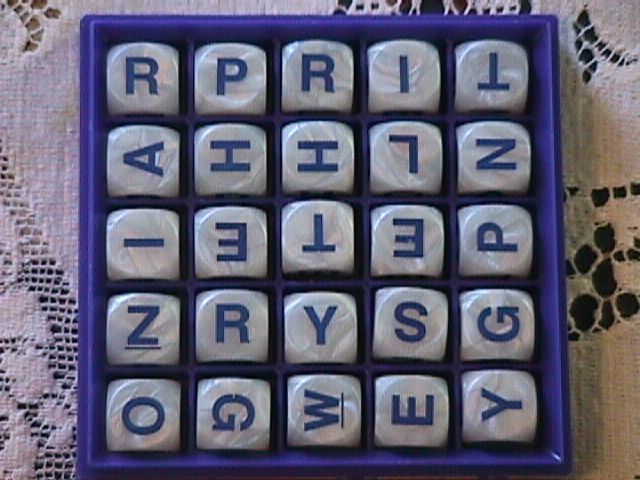 Boggle rules - Note that these rules are for regular Boggle (4x4), but the pictures are from Boggle Deluxe (5x5). The rules and scoring are the same except that 3-letter words are not allowed. Note to local people - we're doing this with 4-letter words included (we usually play 5+). There may very well be both kinds of games at the tournament, though. If you're interested, my scores were 43, 43, 49, and 59, respectively. Return to Kevin's aq.org page.